In a concert my main interest is to create a subtle bond or resonance between the musicians and the audience. 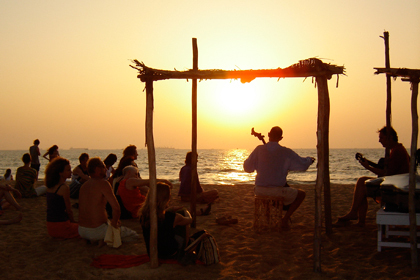 The listeners offer a lake of presence, upon which the musicians can play. So the role of the audience is as central and as important as the musical expression. My challenge as a musician is to help this synchronicity fall into place. How does this work? Intoning a note with our voices or singing a chant or song together is helpful at the beginning of a concert because it helps us to understand that we are participants in a common creation. And for the musicians, staying in touch with the silence behind the music also keeps the presence of the audience tangible. In 2010 I had the chance to give a few concerts called ‘Touch the Sound’ with François Taillefer, an excellent percussionist in Québec. Our only preparation was tuning our instruments and getting “in tune” with each other. When playing with most musicians, however, some basic chord structure and melodic arrangement are helpful as long as our main focus lies on listening to each moment. I have given concerts in Canada, Germany, Switzerland, Greece, India, Costa Rica and Brazil with a variety of musician friends from all over the world. While travelling, the cello, the guitar and voice are my main instruments. For dates of the next concert see calendar on the right. I become a presence, utterly sensitive, a hundred percent connected, just listening – and in the playing I give myself total freedom.